One of the Branches of Gagosian Gallery is located in London’s Kings Cross area, on Britannia Street. Every now and then, when I am in the area I pop in spontaneously to see some great art, which always seems to be on offer at this place. Previously I have seen work there on such occasions by Richard Serra, Glenn Brown or Philip Taaffe just to mention a few names. Most recently I’ve stumbled upon Chris Burden’s show, Measured. Taking photos is allowed so I took a few shots. 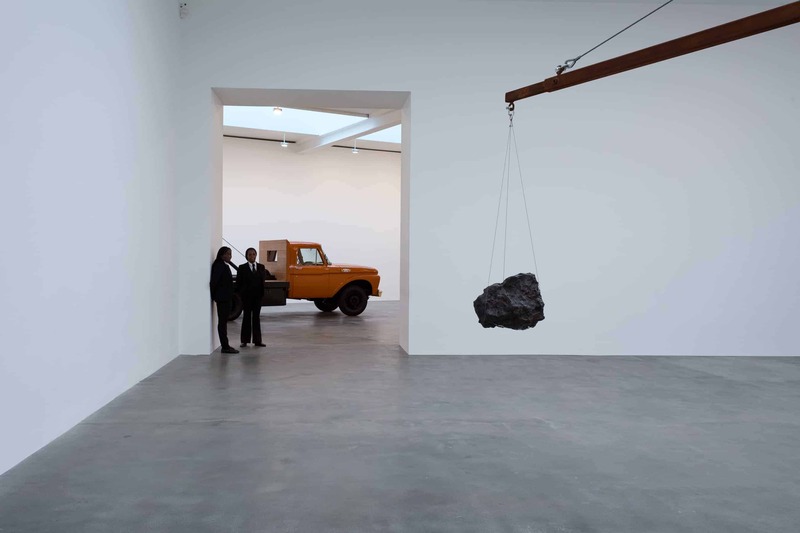 Chris Burden’s work consists of two vehicles balanced by a weight, each a different way. And although I am not so much into cars, the immaculately clean, shiny polished surfaces in bright colours (yellow and orange) in the otherwise empty, featureless spaces were crying out for their photographs to be taken. So that’s exactly what I did. The weights on the other hand were rough (a rusty metal cube and a large raw rock) and compact, which made for an interesting juxtaposition, not just intellectually but visually too. Excellent theme! I have used a full frame digital DSLR (Canon 5D MK III) and a fast wide angle prime lens (Canon EF 28mm f/1.8 USM) to take these shots, which I have then edited in Adobe Bridge for minor adjustments (sharpening, noise reduction and white balance). Although it is allowed to take pictures in quite a few galleries, the lighting is rarely perfect for taking photos so a slightly higher ISO is usually necessary. Then again sometimes I don’t mind a little noise (and as a matter of fact it can be easily reduced to a reasonable level), as it adds some texture to the pictures.